Jack St. Bride lands in Salem Falls after being released from prison after being wrongfully accused of having a sexual relationship with one of his students. He takes a job as a dishwasher at the diner, desperate to escape his past and start rebuilding his life. As he begins a relationship with Addie, the diner’s owner, the town gradually realizes why he’s there and his life becomes more complicated than he ever wanted and he's no longer able to run from his past. I didn’t find my first Jodi Picoult novel a huge success and although I enjoyed it and never at any point did I hate it and want to put it down, I found it just didn’t grab my attention like I hoped. The problem might have been that I read the Jeffrey Archer’s novel ‘A Prisoner of Birth’ early last year which also featured a trial and a suspect that you want to believe is innocent and results in a lengthy trial. Unfortunately Picoult’s Salem Falls paled in comparison and I wish we had read a different one of her novels to start with. I was intrigued with the beginning of this book, but got bored about a third of the way through and already figured out the end well before I was supposed to. I could appreciate Picoult’s writing and marveled at her ability to paint her characters in just a few short strokes so they were memorable even if they only played a small part in the story and if you needed to remember them later, you could. Unfortunately I wanted more from Salem Falls and won’t be deterred from reading another of Picoult’s novels, but I would recommend Archer’s book over this one if you’re looking for a fast paced story about a trial. 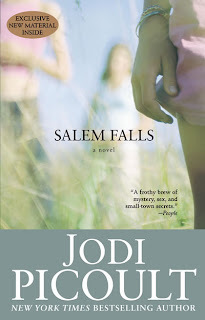 Salem Falls is the first book I’ve read of Jodi Picoult and I really enjoyed it. I was passed this one by my mother which generally means it’s not chick lit so I was expecting something a bit heavier but it was an easy read which was a pleasant surprise. Set in Salem Falls, this novel naturally leads you to thinking about the Salem witch trials- it’s not focused on this which took me by surprise. From the beginning you’re not really sure if the relationship was real or a figment of the imagination of the teenager. You want to believe though that he’s innocent. My only criticism was that I found that the amount of different characters Picoult introduces quite confusing but because it’s written so well you want to keep reading anyway. She doesn’t tend to bog you down with lots of descriptive paragraphs and leans more towards plot development which I definitely liked in this type of novel. I don’t want to give anything away about the many twists and turns but I did have an idea how it would end before I got there but this didn’t stop me from not wanting to put it down though! Salem Falls is definitely worth the read!